The Political Environment: The WI GOP's little men launched a long game. Let's beat them. 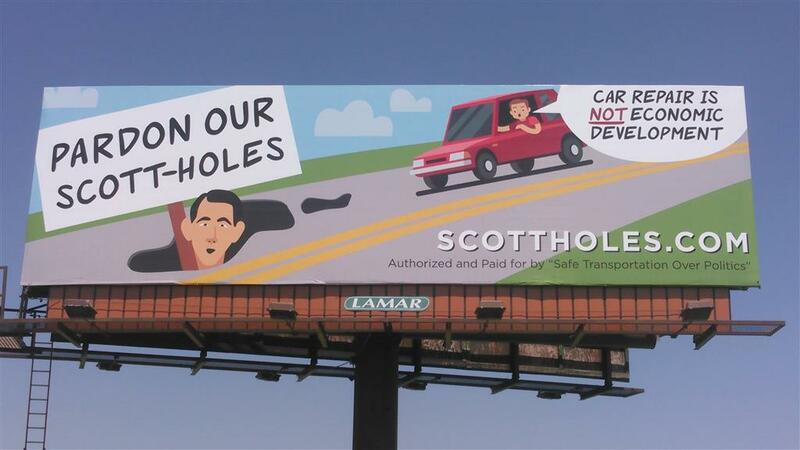 The WI GOP's little men launched a long game. Let's beat them. 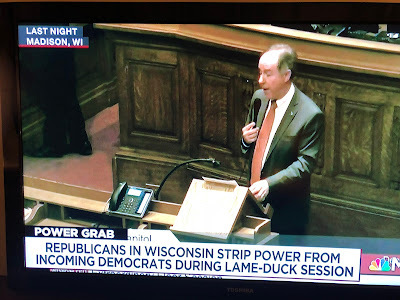 At some point I will turn to other matters, but not yet, so here are a few more words about and suggestions for confronting the right-wing Wisconsin power grab, or as I call it, the "Revenge of the little men" bill. Walker, Fitzgerald and Vos concocted it in private, as has been these elitists' preferred style since they dropped Act 10 bomb. from the State Capitol that his eight-year reign continues to toxify. All three of these Republican officials who negated the voters' collective will, shamed the state's reputation and damaged democracy itself here and for all of America to see did so knowing what they were doing and setting into motion was wrong. They knew what they were doing was wrong because there are everyday proofs of what's right and wrong that are as close as any playground. The teams play and win, lose or draw, the kids line up, high-fives are exchanged and no teams' losing coaches retreat to a bar or someone's living room and change the scorecards or how the outcome influences the standings. And remember, these GOP elected officials are often pictured in their Green Bay Packers team garb. Green and gold gear on Walker's twitter feed this year even exceeded his displays of Brewers' blue or Badger cardinal and white. Likewise, the little Republican men know that when the Packers defeated the Pittsburgh Steelers in the 2011 Super Bowl, the losers did not get to break off a big piece of the Lombardi trophy for display in Pennsylvania because they'd scored 25 points to the Packers 31. These are all zero-sum, winner-take-all contests, and even more importantly, the winner of an election claims the prize on behalf of voters who made their choice. In that sense, the Nov. 6th winners - - Tony Evers, Mandela Barnes snd Josh Kaul - - are stand-ins for the people, so when Walker, Fitzgerald and Vos attacked and nullified the outcome, and took what was not theirs to take, they were stole from the public and its democratic expression. Because every election loser knows the drill: you take the stage, speak into the microphone, concede to the winner, tough it all out and move on, because the people had spoken and that's how that game is played and completed. Refusing to do so, and then changing the rules and the import of the result out of spite, and in service to your often secret financial backers, is a serious and dangerous thing to do. It's literally that simple, that self-centered, hollow and amoral, which is why we are not to be taken in by their equally hollow and amoral and fundamentally dishonest b.s. invented on the fly about needing to rebalance the powers of the legislature and governor's office, and also claiming they did not take any of the chief executive's power going forward. Walker himself gave the lie to those talking points when he used some of the same gubernatorial authority which the "Revenge of the little men bill" - - now law - - stripped from incoming Governor Evers - - to so unilaterally hand Kimberly-Clark a subsidy over five years of up to $28 million in taxpayer dollars. In other words, to stretch his shadow and ill-exercised authority across all of a first Evers term of office. These GOP leaders will lie. Walker had until the December 20th to sign the power-brag package, but did so as earlier. People's memories are short. We can get ahead of this. Republicans are assuming that the courts which Walker has helped pack, and the same monied special interests which kept him and his pals in power will again make their presence known at the State Supreme Court should their little men power grab be appealed there. And then approved word-for-word, and subsequently refused to cleanse of its inherent conflicts-of-interests. In other words, Walker, Fitzgerald and Vos have kicked off another expensive, mentally-taxing and organizationally-demanding long game. And while the barriers for progressives are formidable, the stakes are higher. There will be agendas pushed by Evers, Barnes and Kaul. There's a State Supreme Court race in April. Let's win it with the same level of commitment that sent Walker and AG Brad Schimel packing. And let's win the Judicial election in 2020 which the little men failed to fix in advance for a Walker appointee who wants a full, ten-year term. And let's win the rest of the 2020 local, state and national races, partisan and non-partisan. We need a clean sweep. Donate now to those who are taking the battle which Walker, Fitzgerald and Vos have started to Federal court, understanding the obstacles, but not backing away. Nice commentary. Love the simplicity of the language and the argument made here. "Sometimes, the simplest, most intuitively obvious answer is the correct one." "Sue the bast*rds?" Agreed. Pitch in, Bucky.